It was only a matter of time before genetic engineering went a little 'wild.' Goth cow is a genetically altered cow that went to the dark side. That's just fine with her (Or is it a him. It's hard to tell from the painting). This cow likes its black eyelashes, spiked hair, spider web tattoo and silver bling. Goth Cow will be more than ready for the Halloween season. 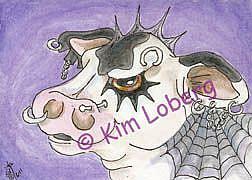 "Genetics Gone Wild-Goth Cow' is an original, whimsical ACEO art card that is currently for sale on eBay.